The Total U-20 Africa Cup of Nations (previously known as the African Youth Championship or the African U-20 Championship) is the main international youth football competition for CAF nations, and is competed for by under 20 year olds. It is held every two years with the top 4 teams qualifying for the FIFA U-20 World Cup. 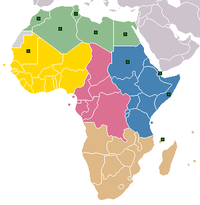 On 6 August 2015, the CAF Executive Committee decided to change the name of the tournament from the African Youth Championship to the U-20 Africa Cup of Nations, similar to the senior's version, Africa Cup of Nations. In July 2016, Total has secured an eight-year sponsorship package from the Confederation of African Football (CAF) to support 10 of its principal competitions, including the U-20 Africa Cup of Nations Champions League, renamed Total U-20 Africa Cup of Nations. ^ "1977 results by RSSSF". Archived from the original on 24 October 2012. Retrieved 3 August 2012. ^ "Nigeria win superb Africa Youth Championship final". BBC. 1 May 2011. Retrieved 5 April 2012. ^ "CAF Executive Committee decisions of 26 May 2015". CAF. 27 May 2015. ^ "CAN 2019 : un dernier sursis pour le Cameroun ?" (in French). CamFoot. 29 September 2018. ^ "Decisions of CAF Executive Commitee [sic] - 27 & 28 September 2018". CAF. 29 September 2018. ^ José Luis Pierrend (15 July 2011). "African Youth Championship". RSSSF. Retrieved 28 November 2011. ^ "Ambitious Ondama targets Congolese triumph". FIFA.com. 30 April 2007. Retrieved 12 March 2013.